The 46th Bharatiya Jnanpith Award was presented to the Dr.Chandrashekhara Kambar, the eighth awardee of this prestigious National Literary Award in Kannada language. Dr. Chandrashekhara Kambar joins the band of illustrious Kannada writers comprising Kuvempu, D.R.Bendre, K. Shivarama Karanth, Masti Venkatesha Iyengar, V.K.Gokak, U.R.Anantha Murthy and Girish Karnad who have received this award in the past. These writers and their works are a glowing testimony to the richness of Kannada literature. 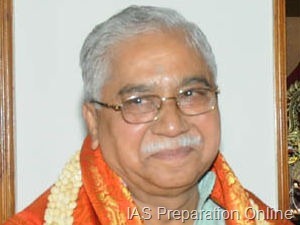 He subsequently not only taught in the University of Chicago and Bangalore University but also became the Vice-Chancellor of the Kannada University at Hampi for two terms. Dr. Kambar was able to develop the University into an important Centre of “Kannada Knowledge” conducting multi-disciplinary research into various aspects of Karnataka. Dr. Kambar has won many awards during his literary career and has been honoured by the nation with a Padmashri. He is well-known as a poet, playwright, short-story writer, novelist, folklorist and film-director. In his writings, he has retained the earthy flavour of rural Karnataka. Dr. Kambar has portrayed through his writings the subjects of conflict between tradition and modernity, identity, feudal decay and colonialism. He has presented in all his writings the perspective and world view of the down trodden. The Jnanpith Award instituted in 1961 by Bharatiya Jnanpith, a trust founded by the Sahu Jain Family is along with the Sahitya Akademi Awards the foremost prize for Indian literature. Over the last half century, it has established itself as a prestigious award recognizing the best of literary talent in different languages of our country. I congratulate and compliment the Trustees for having sustained this outstanding initiative for over five decades and taken it from strength to strength.